An imprint of A&C Black Publishers Ltd.
36 Soho Square, LONDON W1D 3QY. 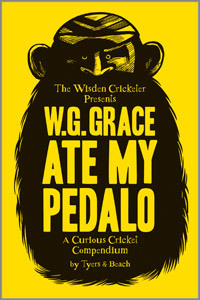 This is a very different type of cricket book looking at cricket in 2010 through an 1896 Victorian perspective. The writing style of Alan Tyers, complemented expertly by the sketchings of Beach, takes an irreverent look at the cricketers of today viewed and written in a very realistic Victorian way. The Flintoff pedalo episode in the West Indies may have attracted the book's title but other well-known cricketers such as Boycott, Pietersen and Warne do not escape lightly. The book is a collection of articles written in 1896 style and the Personal Notices, amongst other witty writings, makes this a very enjoyable and light-hearted read. There is even a letter from Oscar Wilde even if, from his famous quote, he did not play cricket as "it requires one to assume such indecent postures". The excellent sketches by Beach would certainly back up this assertion. Little escapes Alan Tyers's imagination: IPL, character profiles, the extraordinary names given on scorecards and the Barmy Army. All in all, a completely different but entirely enjoyable book.